While browsing Japanese recipes, you might have wondered what is mirin? 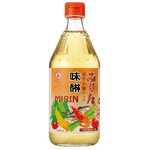 Mirin is a Japanese wine that is most commonly used in cooking. The flavor is quite sweet, which provides a nice contrast in combination with other Asian sauces such as soy sauce. Mirin is a versatile ingredient for all kinds of Japanese dishes. Mirin is used to add a bright touch to grilled (broiled) fish or to erase the fishy smell. A small amount is often used instead of sugar and soy sauce. Ingredients: water, glutinous rice, sugar, salt, flavor enhancer E640, E635, citric E331, alanine. Product of Taiwan.